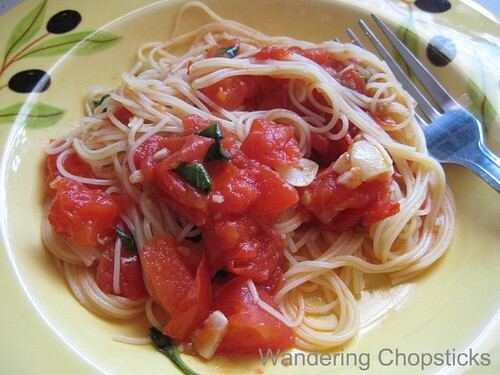 Another of my simple summer pleasures is pasta pomodoro (Italian tomato pasta). This pasta works best with fresh tomatoes and basil. I like them roughly chopped so I can still taste the freshness of the tomatoes and basil leaves. I like to boil my pasta at the same time that I make the sauce. Time it right and the pasta should be done when the sauce is. So then I just use a pasta spoon to ladle the pasta into the sauce. It's OK if the pasta is a bit wet. I think of it as the same as people who save the pasta water to thicken the sauce. A slightly wet pasta will thicken the sauce naturally. Heat the pan to medium, add 1 tblsp olive oil and 4 cloves of minced or thinly sliced garlic. When the garlic is slightly softened, add 6 chopped Roma tomatoes. Let the sauce simmer uncovered. When the pasta is almost ready, add the julienned basil leaves into the sauce and give it a quick stir. Then add the pasta into the sauce and toss. 1 year ago today, basil seed drink. Oh, yum. at this time of the year, it is perfect simplicity that is best. You just demonstrated how a delicious meal can be made so simply! I still don't understand why ppl rationalize eating out all the time by saying that cooking takes too much time. It usually takes longer to: decide where to eat, hop in the car and drive there, order, wait, eat, pay, and then go home! Heh. Whenever I see a tomato recipe, I hear the theme song from Attack of the Killer Tomatoes in the back of my head. I like to stir in mascarpone cheese with mine. It's a delicious, easy way to thicken sauce. Yummy! I can see my kids destroying a perfectly healthy dish like this by piling on the cheese on top. Looks very fresh! Some people really can't cook or want to, so it is faster for them to eat out. Not for me though. Mascarpone cheese? So decadent. I can barely justify buying it to make tiramisu. Yeah, my sister would probably sprinkle parmesan cheese all over it too. You can use any kind of tomatoes! But for some reason, I really do think Romas taste best for this.